How about some gasoline to go with that 62-ounce jar of pickles? It’s a given that more drivers are turning to the big box to top off. Just this week, consumer surveyor Market Force said US motorists for a second straight year picked Costco as the place where they like to buy gas. (Sam’s Club was No. 2.). Costco, the temporary home of eyeglasses, Coho salmon, pre-boiled eggs and 72-inch TVs, is a company for all seasons. “They do good when gas prices are high and when gas prices are low,” Citigroup retail analyst Deboran Weinswig recently told CNBC. California offers a fascinating case study of Costco’s appeal. Consider that when Tesoro said earlier this year it was buying 800 Arco stations in the state and California’s largest refinery to pair with its own refinery outside Los Angeles, a few cried foul. California drivers are attuned to wide swings at the pump; spot prices of California-grade gas jumped 35 cents in one day just this week. And right after the sale, U-T San Diego business columnist Dan McSwain suggested there was no reason for everyone to get the hair standing up on the back of their bronze-tanned necks. Costco has become such a market force that it swats aside any attempts to dominate the California retail gasoline market, he wrote. It also managed expectations in the good times by not letting franchisees raise prices too much. “Then when things go bad and everyone is drinking their own blood, you’ve become accustomed already to a margin you can live with,” the oilman said. Maybe there was too much discipline. About 100 Arco franchisees still have a lawsuit pending against BP, in fact, saying they were unfairly shut out and lost their livelihoods, said David Schiller, a Texas attorney for the franchisees. Tesoro is not a defendant in the case. 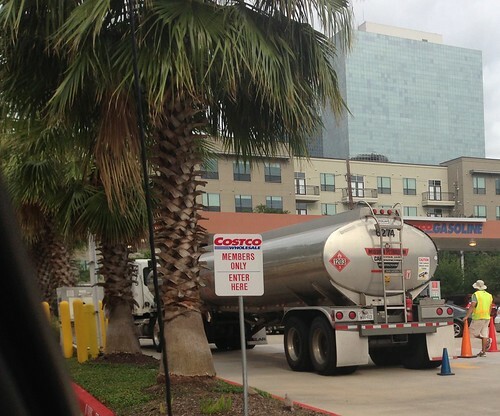 Safeway, meanwhile, has struck up an alliance with California’s other major refiner, Chevron. Now, about that consumer protection matter. When Tesoro announced the purchase of the Arco stores and the BP refinery in Carson, California, Attorney General Kamala D. Harris said Tesoro had agreed to boost production of California-grade gasoline, CARBOB, in Carson by 400 barrels a day. Not 4,000. 400. Just 16,800 gallons. It reminds you of those famous typos you always read about. But Kathleen Foote, a spokeswoman for Harris, told Platts the figure was correct. “Four hundred barrels is not even enough to power my boat for a week,” one West Coast trader said. Or fill up the tanks of Costco customers for a couple of days. Good points all. It’s also worth looking into how many electric charging stations Costco has at its California stores, if any. You can’t go to a Whole Foods without bumping into one of those these days. We should be able to go to Costco and have replacement fuel options for our vehicle. If a vehicle is not flex-fuel consumers should have the option to convert their car (which can be done for under $300) to run on a combination of ethanol, methanol and gasoline. But with outdated regulations this is not possible. We are stuck with no options and high gas prices.